Make active play fun for the entire family! Allow children to help choose and plan how the family will be physically active. Be sure to focus more on fun, not on performance or competition. Set aside time daily or throughout the week when the entire family can be physically active together. Try doing something before or after dinner or on weekends. Plan a weekly Family Fun Night that includes riding bikes, swimming, or dancing. Plan activities that require little or no equipment like walking, jumping rope, playing tag, or dancing. Learn and explore parks, hiking trails, biking trails, swimming pools, tennis courts, and community centers in your area that can provide low-cost opportunities to be physically active. Be Active inside and outside! Spend time outdoors and be prepared for all weather conditions. There are a lot of activities your family can enjoy in the rain, mud and snow! 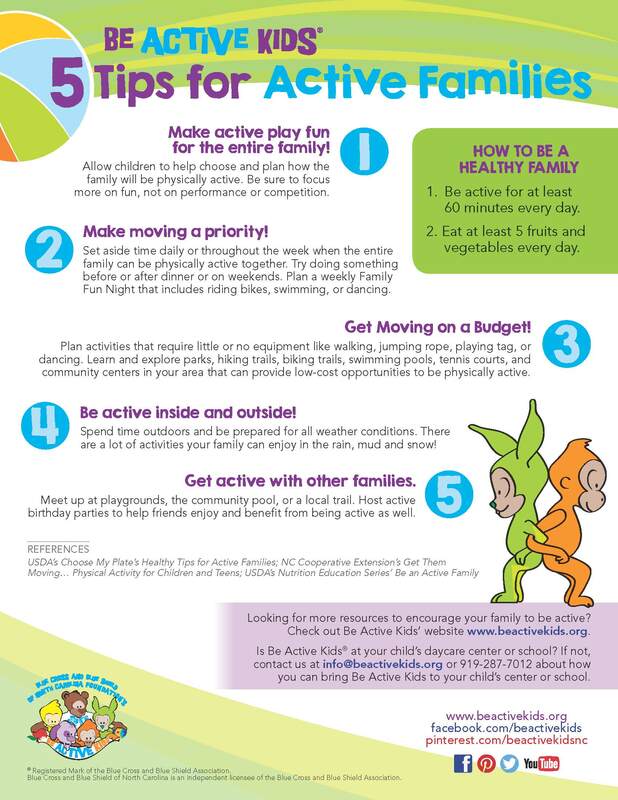 Get active with other families. Meet up at playgrounds, the community pool, or a local trail. Host active birthday parties to help friends enjoy and benefit from being active as well.